Solar panels are incredibly reliable. Most systems have no moving parts, and the lifespan for a solar panel can exceed thirty years. This means that solar panel installation companies routinely offer very long warranties and maintenance packages as part of your system cost. Despite this, some preventative maintenance may go a long way towards the longevity and efficiency of your system, and it’s good to know what to do if there is a problem with any of your panels. Follow these tips for decades of clean electricity and savings on your energy bill. Solar panels require very little regular maintenance. Generally, any failures that do occur are related to electricity production or corrosion in the wires that tie your system to the inverter, rather than with the panels themselves. Remember, though, that solar panels produce electricity only if the sun is shining directly on them. Any obstructions from dust, snow, or vegetation will cut into your production—or halt electricity generation altogether. If you live in an especially dusty area or an area that experiences regular snowfall, keeping your panels clean and unobstructed will result in more power generation. 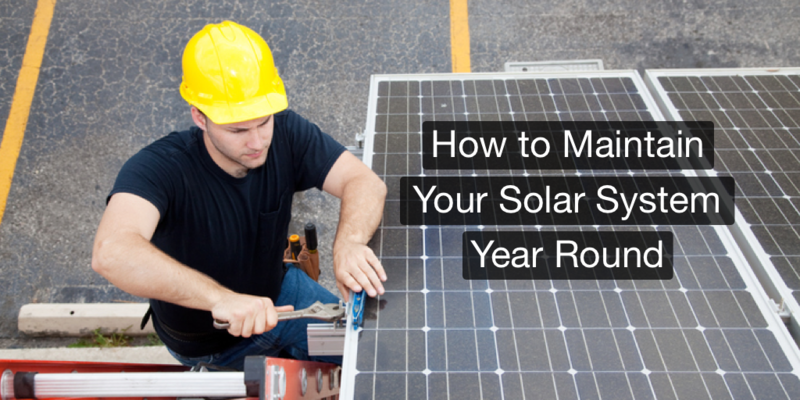 Summer should be a very productive season for your solar array. However, your panels may become clouded by dust, grime, animal droppings, or tree pollen from time to time. A rainstorm is usually enough to clean off a solar panel, but in arid climates, summer storms are few and far between. If you live in an especially dusty area, and you aren’t expecting any rain, you can rinse dust off with a garden hose. This method is ideal if you can safely reach your panels from the ground without a ladder. Be sure the water you’re using to clean your solar panels is demineralized; hard water can cause scaling or corrosion over time. For homes where dirt or pollen buildup becomes a recurring issue, installing a roof-mounted sprinkler system is an option to take the headache out of regular cleaning. Make sure your sprinkler system is installed under the supervision and approval of your solar installer, so the sprinklers won’t negatively impact your roof or your panels. Solar panels can keep producing energy well into the fall—as long as they aren’t covered in loose leaves or other vegetation. There’s no guarantee that your roof and array will stay leaf-free, however, even if you don’t have tall trees overhanging your home. Autumn winds can carry debris into the air, depositing it on your panels and rack. Fortunately, leaf removal is one of the easier solar maintenance tasks out there. It’s on par with cleaning your gutters. If you have proper safety equipment—sturdy rope, a harness, a ladder, etc.—you may be able to tackle the job yourself. Before you do, though, check your panel warranty to ensure that you won’t accidentally void it by using a brush or roof rake to clear leaves. If you’re unsure about your ability to do the project on your own, you can always consult a professional cleaning company. For areas with high chances of snowfall, regular snow removal may be difficult. Most of the time, snow on your roof will melt off over a day or two from the heat of the sun and the heat produced by your home—though the panels will need at least a fifteen-degree tilt for this to work well.1 In the event that it’s too cold for the snow to melt off, a long broom or snow rake can help you clear drifts. Again, check your warranty to ensure it won’t be voided by the use of cleaning tools. Ice buildup is another concern, as it may weaken your roof and threaten the integrity of your solar panels. Removing ice from your roof may be necessary in some cases to prevent eventual water penetration, pooling, or even structural damage. However, the use of salt as a snowmelt may cause corrosion on your rack or the panels themselves, making ice removal a challenge. Situations like these warrant consulting a professional maintenance service recommended by your solar installer to prevent any long-term damage or issues. Besides ice buildup, you shouldn’t have to worry about the integrity of your solar panels in most weather conditions. Even serious weather events like hailstorms are within the strength tests of the tempered glass used on solar panels. However, in the event one of your panels becomes cracked, contact your solar installer immediately for repair or replacement of the broken panel. Depending on your system, your solar installer may also choose to conduct isolation tests to determine if there is any damage to the wiring insulation, or any resistance from loose or broken connections. If you notice a drop in your production, or if your system monitoring has revealed a dead panel, these tests can be conducted to isolate the problem for maintenance. 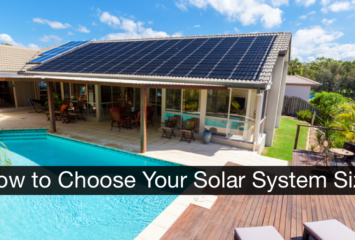 The wiring that ties your solar panels to your home should last for the life of your system. The best way to avoid any electrical issues is to go with an experienced and certified installer. Expert installers know where systems commonly fail, and will avoid poor wiring that could result in water exposure or other issues that might halt your production. Many modern systems also come with real-time system monitoring, so you should be alerted to any electrical issues fairly quickly. These monitoring systems usually output data to the web or an app on your smartphone. You can check the production totals of each individual panel. This is useful for quickly spotting any “dead” panels that aren’t producing electricity, either due to a problem with the panel itself or—more likely—the connection between the panel and the inverter. Any time you notice an unexpected loss in electricity production, you should contact your solar installer to come do an inspection of the wiring. Most solar systems are tied to the electrical grid, making any maintenance potentially hazardous. Never attempt to repair any component of your solar system yourself. The Solar ABCs recommends any solar maintenance be conducted in pairs by trained technicians, with two CPR-trained professionals at the jobsite at any time.3 This requirement highlights the danger in working with electrical systems and the importance of hiring an installer with the certifications to conduct maintenance down the road. More than anything, consider your own personal safety when cleaning your solar panels. Almost all reputable installers will be happy to put you in touch with a cleaning service that can do the job professionally. With proper maintenance at set intervals, frequent visual inspections, and regular cleaning of your panels, you should experience relatively problem-free ownership for decades. Be sure to look at the track record of your solar installer to ensure they’ll take care of your solar system for the extent of its productive life. Well-established solar companies with experience, certifications, and local knowledge are the best choices for your installation. 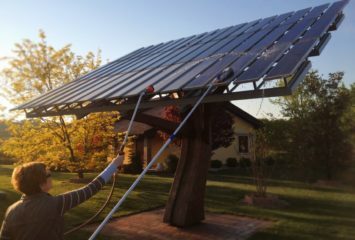 I had no idea that you had to use demineralized water when cleaning your solar panels. It makes sense that taking the time to know this can help you avoid scratching them and make sure they are clean enough to absorb as much light as possible. My brother is thinking about installing solar panels on his house, so I’ll share your page with him.